Here's a list of restaurants that have "Kids Eat Free" deals around Ventura County! These deals are subject to change at a moment's notice, so make sure to call the restaurants in advance! Let us know of any changes or additions! Now let's go EAT!! Kids Eat Free on Wednesdays 4pm to close at Patron Mexican Bar & Grill, 1620 Newbury Road, Suite 2, Newbury Park. One kids meal with purchase of an adult meal for kids 12 and under. Kids Eat Free all day on Mondays/Tuesdays at Macaroni Grill. For ages 12 and under with purchase of adult entree. Location at 2920 Tapo Canyon Road, Simi Valley. D'Amore's Famous Pizza at 300 N. Lantana in Camarillo is currently offering a Kids Eat Free deal on Sundays all day for ages 4 to 12. One child per paid adult meal, dine in only. Call 805.445.6534 to confirm. Denny's offers Kids Eat Free for 10 and under from 4 pm to 10 pm on designated nights. Up to 2 free kids meals for each paid adult entree. Call location to confirm. Here's a handy list of frozen yogurt, ice cream and gelato places in and around Ventura County for your dining pleasure. There are over 90 such establishments in Ventura County and surrounding areas. Raspado House at 540 N. Moorpark Road, Thousand Oaks has shaved ice. Thrifty Ice Cream, a brand that brings me visions of childhood joy, is still around at Rite Aid stores throughout Ventura County. According to the Brewers Association, there were 6,372 total U.S. breweries at the end of 2017, up 16% from one year prior (and over double the number of breweries in 2013). Over 98% of these breweries are craft breweries, consisting of microbreweries, brewpubs and regional craft breweries. A craft brewer is defined as being small (annual production of 6 million barrels of beer or less), independent and traditional (flavors derived mostly from traditional or innovative brewing ingredients). We've seen and experienced this growth in and around Ventura County, so how about if we summarize them right here! This list includes local craft breweries with onsite tasting rooms ranging from the Conejo Valley out just past Ventura County into Carpinteria. Poseidon Brewing Company opened its tasting room on August 11, 2014 at 5777 Olivas Park Drive, Unit Q, Ventura and is open Tuesday through Sunday. Ooh, they offer up a free pint on your birthday if you present Valid ID with birthdate! www.poseidonbrewingco.com 805.477.0239 Also a dog-friendly tasting room. Transmission Brewery and Tasting Room is being built at 1098 East Front Street, Ventura. Seaward Brewing is now open at 1920 Goodyear Ave., Suite D, Ventura. www.seawardbrewing.com Seaward is a microbrewery offering craft beer brewed onsite with 10 rotating taps. Food trucks available on weekends. Food can be brought in. Family and pet friendly! Hours are Tue-Thu 3-9pm, Fri 3-10pm, Sat Noon-10pm and Sun noon-7pm. A second Rincon Brewery is open at 4100 Telegraph Road, Ventura. Follow their Facebook page for updates at www.facebook.com/pg/rinconbreweryventura. Some additional craft beer tasting options in the area are highlighted below. These ones serve up tap beers from other craft breweries and/or produce the beer elsewhere. We have included on this list bars/taverns serving up at least a dozen craft beers on tap. Bottle & Pint is a specialty craft beer store and taproom at 1714 Newbury Road, Suite G, Newbury Park. Open seven days a week, they have a revolving list with 20 beers on tap. Bring your own in or have it delivered. 805.480.9500 www.bottleandpint.com. Bottle & Pint has a 2nd location at The Annex, a cool food "court" area within The Collection at RiverPark in Oxnard. LOOKING FOR WINE? CLICK HERE FOR LOCAL WINE TASTING OPTIONS! Darryl's Couch was a craft beer bar located at 795 Camarillo Springs Road in Camarillo. www.darrylscouch.com They closed on Sunday, March 11, 2018, after operating for 5 1/2 years. Now located there is The Local Beer & Wine Bar. Surf Brewery was the first packaging craft brewery in Ventura County when it opened in June 2011. It closed in early 2018. Now operating at this location is Concrete Jungle Brewing. 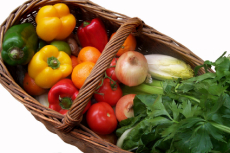 Looking for fresh produce in Ventura County? "Lettuce" help you! There are over a dozen farmers' markets in and around Ventura County each week, not to mention another dozen or so stores and Community Supported Agriculture programs that sell organic produce. Times, dates and places subject to change. Let us know of any updates! VENTURA: Thursdays 3 pm to 7 pm at Ventura Community Park, 901 South Kimball Road Visit www.facebook.com/EastandWestVenturaFarmersMarket for more information. Open rain or shine. CAMARILLO: Saturdays 8 am to noon 2220 Ventura Boulevard camarillofarmersmarket.com. Proceeds benefit Camarillo Hospice. Call 805.386.3584. OJAI: Sundays 9 am to 1 pm at 300 E. Matilija Street year-round, rain or shine. Produce, flowers and gourmet food. Call 805.698.5555. www.ojaicertifiedfarmersmarket.com. Underwood Family Farms Market at 3370 Sunset Valley Road, Moorpark has farm fresh produce, pickled items, honey, nuts, juices, dried beans, farm fresh eggs and fresh cut flowers. Moorpark location is usually closed from late December through February. Open 9am to 6pm March to November and weekends in December (5pm after DST). Call 805.529.3690. Underwood Family Farms Market at 5696 E. Los Angeles Avenue in Somis is open every day year-round 9am to 6pm (5pm after DST) with the exception of some holidays. Call 805.386.4660. Underwood Family Farms Market in Moorpark. McGrath Family Farm at 505 North Wood Road, Camarillo is open March through December 9am to pm and offers organic fruits, flowers and vegetables. Freeway convenient off the Central Avenue offramp of the 101. Call 805.983.0333. Lassen's Natural Foods, with locations in Thousand Oaks, Oxnard, Camarillo, Ventura and Simi Valley, has offered fresh produce since 1971. Thousand Oaks (600 W. Hillcrest Drive, Thousand Oaks) 805.716.4373. A & F Country Market is at 4550 Olivas Park Drive in Ventura. From Thousand Oaks, take Victoria offramp from 101 south to Olivas Park and make a right. Store is on your left. Nice stop on your way to/from the Olivas Adobe and Ventura Harbor Village. 805.644.5470. The Berry Best stand at 3030 Dodge Road (at Pleasant Valley Road, just east of Rice Avenue) is strawberry, fruit and vegetable stand. Call 805.271.4490. Local Harvest Delivery is based in Santa Barbara and delivers harvest boxes to homes as far as Ventura and Ojai. Hello Harvest local delivery service has been serving Ventura County since 2010. Visit their site or call 805.551.3454 for more information. The Camarillo Health Care District has partnered with Food Share to distribute a variety of free produce items on the 2nd Thursday of each month from 11am to 1pm. Supplies are limited. NEWBURY PARK: Fridays 2pm to 7pm (The Village at Dos Vientos Ranch). www.facebook.com/goldenstatecertifiedfm Announced on 12/9/13 that market is closed. SIMI VALLEY: The Simi Valley Town Center Market was discontinued effective 11/26/14 after running for a year and a half. AGOURA HILLS: Sundays 9 am to 2 pm at 5835 Kanan Road (Agoura's Famous Deli parking lot) closed 6/28/15. CAMARILLO: Wednesdays 3-7pm Pleasant Valley Certified Farmers' Market at the Camarillo Community Center parking lot closed 9/30/15. It's nice finding Kids Eat Free deals around Ventura County but there are also dozens of local rewards programs and birthday clubs that give you something for FREE!!! This list includes programs where you get something for signing up or for being a repeat customer...a free burger, gift card, dessert, etc. Excluded are programs that do not provide an obvious freebie (i.e. only sends you promotional emails). These deals often change, so click through to the restaurant website to confirm the deal is still good. Let us know of any changes, broken links or additions!! VENTURA COUNTY AREA DAILY DEALS AND PRINTABLE COUPON WEBSITES! Piece of the Pie Rewards: Order online and earn points towards free pizza. Locations: All over the place! My Loco Rewards: Sign up and get a free taco al carbon and free birthday rewards. Pancake Revolution: Free meal for signing up, on your birthday and on the 1 year anniversary of signup! Tiki Link: Free gift on your birthday and special promotions. Jamba Insider Rewards: Earn points for each purchase by entering your mobile phone number to cash in for $3 discounts. Free birthday smoothie or juice. Jeni's Splendid Ice Creams at The Commons at Calabasas offers a free ice cream on your birthday. Birthday guests can order any single, standard, or trio size ice cream in a cup or cone of their choice, and get their order free of charge. The birthday special is only applicable on a customer’s day of birth. Adults must show a valid ID, and kids must be accompanied by an adult who can vouch that the day is their real birthday. Email Club: Sign up and get special promotions. I was pleasantly surprised when I received an email with a coupon for a regular sub and 22 oz drink redeemable on my birthday). Shore Points Club: Register and earn points for each sandwich purchased. Redeem points for sandwiches. For example, each regular sub earns you 6 points; with 12 purchases you've earned a free regular sub. Effectively this is an 8% discount. Locations: Over a dozen locations...Ventura, Camarillo, Newbury Park, Ojai, Oxnard, Calabasas, Simi Valley, Moorpark, Westlake Village, Thousand Oaks, etc. Rocket eClub: Sign up and get a free burger (with purchase of entree and a drink...basically a buy one, get one free) at signup and at your birthday. Krispy Kreme Rewards App: Register and get a free Original Glazed doughnut. Earn points towards free doughnuts and drinks and get a free gift on your birthday. Maria's Kitchen Club: Free birthday dessert. Earn $10 for every $200 spent (effectively a 5% discount). My Smileage Club: Earn a Smile point for each dollar spent. Cash in 50 smiles for $5 towards a future purchase. That's a 10% rebate in my book! E-Club: Free slice of crepe cake or two-pack of muffins or croissants for joining and free slice of crepe cake on your birthday. MOGL is a rewards program where you sign up your credit card(s) and receive a percentage (usually 4 to 10%) cash back when you dine at restaurants in the MOGL program. They pay your rebates directly to your credit card. As of January 2019, some of the local restaurants in the MOGL program include Subzero Ice Cream (10%), Zin Bistro, Petra Mediterranean (4%), Karma Indian Cuisine (10% cash back), Cupid's Hot Dogs Simi Valley (5%), Grabbagreen Thousand Oaks (4%) and Hatch Cafe & Market (4% cash back). Deli Dough Loyalty Program: Earn 1 point for every $1 spent. 75 points = $5 in Deli Dough. MyPanera: Sign up and receive a free "surprise" like a free pastry or sweet. Then receive other surprises as you accumulate points. PapaRewards: Earn 1 point for every $5 you order ONLINE (including tax and delivery). Accumulate points for food items. Peetnik Rewards App: Free beverage after first check-in. Earn point for check-ins; exchange 15 points for free drink. FREE drink on your birthday! P.F. Chang's Rewards gets you a free entree when you earn enough points. PieLife eClub: Receive a free pizza on your birthday (with purchase of an entree) and a free cinnamon churro pizza when you sign up. Pizza Lover's Club: Free pizza on your birthday and much more. RevRewards App: Use the PizzaRev app and earn one point for each dollar spent. Exchange 100 points for a free pizza or entree salad. Also receive a birthday surprise. Free Birthday Pint! Oh yah, a free pint of craft beer on your birthday, with valid ID showing birthdate (and of course assuming you are of legal drinking age. RedBrick Rewards: Earn 10 points for every dollar spent. Receive $10 reward for every 1000 points. Effectively a 10% discount. Receive a small gelato after registering. My Red Lobster Rewards: Earn points for your purchases and redeem for food items. Receive something on your birthday too. Red Robin Royalty: Free burger on your birthday and every 10th item free. Regency Rewards: Earn points on purchases. 10 points for each adult ticket...100 points gets you a free companion ticket. Rita's Birthday Club: Sign up and receive free birthday treat. Beach Club: Receive free food offers, promotions, etc. via email. First email gets you a free fish taco. Sbarro E-Club: Receive free slice of NY style cheese pizza for signing up, plus special promotions. Subway MyWay Rewards: Earn 4 tokens for every $1 spent on food and drinks. 200 tokens = $2 reward. 7Rewards Loyalty Program: Download app on your smartphone, scan when you purchase coffee, Slurpees and other fountain drinks, and get 7th drink free. Not a bad deal! Sharky's Rewards: Earn 1 point for every $1 spent. 100 points = $7 good toward future purchases. Effectively a 7% discount. Locations: Calabasas, Camarillo, Newbury Park, Thousand Oaks, Simi Valley, Ventura, Westlake Village and Woodland Hills. My Starbucks Rewards: Members receive a free birthday drink or treat. Free refills and other items based on number of Stars collected over designated periods. Sweet Rewards: Sign up and get a free cup of frozen yogurt on your birthday. Visit 10 times and get a free cup. Friday's Rewards Program: Earn points and redeem for food awards. Also receive free appetizer or dessert after joining, free dessert w/purchase of entree on your birthday and more. Kilt Clan: Sign up and receive a free birthday burger, boneless wings on your birthday and more. Urbane Cafe App: Download the app, use it to pay for your purchases, and receive $5 credit for every $100 you spend; a 5% discount. I was surprised to also receive a $10 birthday credit. VG Rewards: Sign up via the VG Rewards App and earn points towards free food. Receive $5 off after joining. Email: Sign up and receive a birthday surprise (don't know what this surprise is yet but I shall find out). Wiener Lovers' Club: Get a free chili cheese dog for signing up and other stuff. Vibe Club Rewards: Get a free drink for signing up. Earn points and get free sandwiches. Email Club: Free fries for signing up and a free birthday gift. Real Rewards Program: Earn points for each ounce purchased and exchange points for free yogurt and birthday treats. My Pretzel Perks: Free pretzel after signing up. Accumulate 300 points for a free pretzel. $1 spent equals 10 points. Club Baja: Free taco for signing up and a "special treat" on your birthday. Bandits' Roundup Club: Free birthday gift, specials and more. Barnes & Noble Kids' Club: Free birthday cupcake and $5 gift certificate for every $100 spent on kids' books, plus 30% off one kids book. Birthday Club: FREE 2.5 oz scoop on your birthday! BJ's Premier Rewards: Earn 1 point for each $1 spent and redeem for discounts. For example, cash in 350 point for $25 off your meal, effectively about a 7% rebate. Blazin' Rewards: Earn 100 points for every $10 spent. Exchange point for food rewards. Examples: 250 pts = soft drink, 650 pts = street tacos, 1,250 pts = burger entrees. "Yozen Rewards" program at Yozen Frogurt in Westlake Village gives you 1 point for every dollar spent; exchange 30 points for 8 oz of yogurt. The 7Rewards app at 7Eleven offers up a free drink for every six scanned purchases as well as other free periodic goodies. CPK Rewards: Free small plate when you register. Earn 1 point for each $1 spent. 75 points equals a $5 reward. E-Club: Free dessert for joining, then another dessert on your birthday. My Chili's Rewards: Get free chips and salsa or non-alcoholic beverage on every visit. Free dessert on your birthday. My Cold Stone Club® Rewards: Earn 1 point for each dollar spent. 50 points can be used as a $5 reward towards purchases of $5 or more. 25 points earned just for registering. Corner Bakery eClub: Sign up and get a free “sweet” (pastry, cookie, baked item). Then get emails with special offers. Blizzard Fan Club: Sign up at get a Buy One, Get One free Blizzard® Treat and a special coupon on your birthday. Pita Points E-Club Program earn one point for each dollar spent; 100 points = $5 off any purchase. Plus another $5 credit on your birthday. Dave & Buster’s Rewards: $10 free game play with $20 game play purchase for joining. $10 free game play for every $100 spent. Raving Fan EClub: Get 2 free grilled chicken soft tacos for signing up and a free shake on your birthday. Denny's Rewards: Sign up and get 20% off your next visit. Separately, get a free Grand Slam breakfast on your birthday - bring ID! Firehouse Rewards App: Use their app and earn points towards free subs and more. Get free birthday sub too. Gourmet Food Trucks are one of the hottest trends around town today. Here's a compilation of recurring food truck events in and around Ventura County and adjacent areas for your dining pleasure! Note: Dates/times can vary and change, so check with organizers, particularly if there is inclement weather. Food Trucks the 1st and 3rd Thursday of the month at Sunland Vintage Winery, 1321 E. Thousand Oaks Boulevard, #108 in Thousand Oaks. Here are a few annual gourmet food truck events for your dining pleasure. Food trucks make an appearance of course at hundreds of events throughout the year, but those listed here have them as a primary focal point of the event. These are just a few. Something to add? Contact us! Food Truck Fests No More: The Foothill Food Truck Fest at the Poinsettia Pavillion in Ventura was discontinued in September 2016.